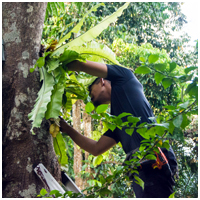 “I think I’m going to make the ceiling higher” says Helson, a research assistant from Gaia, as he uses a chisel to increase the height inside a natural cavity in a Bread fruit tree, or locally known as a Tarap tree (Artocarpus). While he chisels away, a pair of hornbills, the Oriental pieds perch nearby and the male hornbill observers Helson closely. The pair is keen to know what is happening to the cavity they have been interested in, to use as their nest. 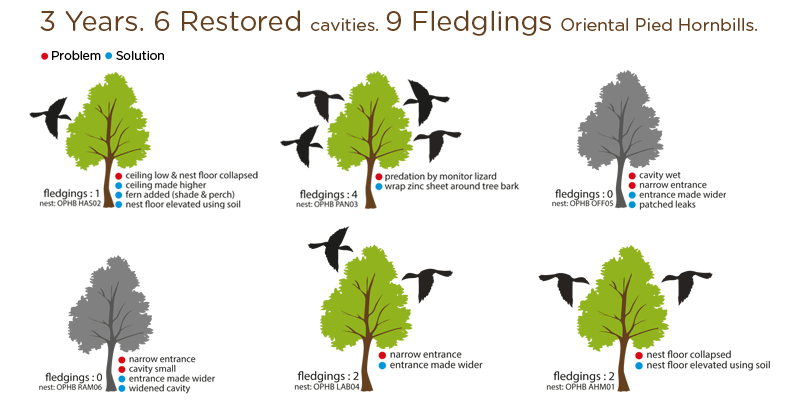 From our research and observations, we know there’s a problem with this natural cavity, cause it has yet to be used by the birds. It is not big enough yet to fit the female hornbill and its entrance faces the direct sun. Hornbills, even with their big bills, are not capable of making the nest cavities on their own. They rely on other animals that excavate cavities, such as woodpeckers. In this case, they were hoping the humans could fix their problems! “What’s wrong with this tree?” asked a couple of young kids as they watched curiously, how grown men were busy modifying the tree cavity. “It’s haunted and so we need to treat it” said Mahathir with a straight face. “Please tell them the truth!” I urged, as I repressed my laughter. 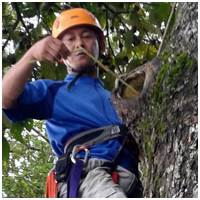 “This tree can become a nest for the hornbills, but we have to make some changes to it, to make it more suitable. Right now, it is too small inside to fit the female and her eggs and the flooring has collapsed, deep inside the tree” explained Mahathir, an officer from the ngo HUTAN/KOCP. And so, the team added soil, to elevate the cavity flooring, increased the space of the cavity inside and placed a large tree fern on the entrance, to provide shade and a perch. As the months passed, the tree fern withered away, but the dried plant provided a bit of shade and the ideal perch for the male. In 2018, they started to nest and had a chick fledge from this nest. 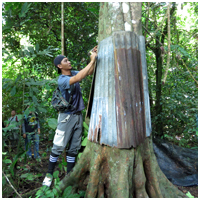 This is just one of the many tree cavities that the Gaia team has restored with HUTAN/KOCP. As a result of this intervention, nine Oriental Pied chicks have fledged from several restored trees. Though nest restoration works were conducted for a common hornbill species, it is a learning process for the Kinabatangan Hornbill Project team and in time, we’re sure, nest restoration activities will offer nest opportunities to other rare, more endangered hornbills such as White-crowned hornbills.